The press release below announces the tenth anniversary of the first Talking ATM in the United States. As a result of extensive advocacy by the blind community and industry effort, it is estimated that there are now close to 100,000 Talking ATMs in the U.S. and around the world. The Law Office of Lainey Feingold extends its appreciation to Wells Fargo for its statement below in recognition of the 10 year Talking ATM anniversary, and to all those individuals, organizations, and institutions in both the blind community and the financial industry who have, and continue, to work with and trust the Structured Negotiations process to help advance accessible technology. Find additional Talking ATM information on the FAQ page of this website. Find articles on Talking ATMs, Talking ATM press releases and Talking ATM Settlement Agreements through the Categories Page on this website. Washington, D.C. (October 1, 2009) — The American Council of the Blind and its affiliates in California, Massachusetts and around the country, are proud to recognize October 1, 2009 as the 10th anniversary of the first Talking ATM in the United States. Ten years ago, the first Talking ATM was installed in San Francisco, California. Since that time, ACB and its affiliates, led by the California Council of the Blind, have engaged in extensive Talking ATM advocacy. Today, as a result of that advocacy and the work of ACB members and others, there are tens of thousands of Talking ATMs in the U.S. and around the world. ACB congratulates blind advocates across the country for persistent effort over the past many years to increase independent and confidential access to financial information and technology. Other banks who have been champions on this issue since the beginning include Chase Bank (with over 11,000 Talking ATMs) and Bank of America (with over 16,000 Talking ATMs). Talking ATMs allow blind and visually impaired customers to privately and independently use ATMs. 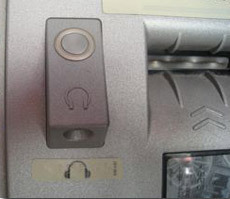 The machines provide spoken instructions for all ATM functions delivered confidentially through a headset. They ensure financial privacy so critical in an era of rampant identity theft. Learn more in the Talking ATM FAQs on this website.